Today we are launching the five new EC2 bare metal instances that I promised you a few months ago. Your operating system runs on the underlying hardware and has direct access to the processor and other hardware. The instances are powered by AWS-custom Intel® Xeon® Scalable Processor (Skylake) processors that deliver sustained all-core Turbo performance. The M5 instances are designed for general-purpose workloads, such as web and application servers, gaming servers, caching fleets, and app development environments. The R5 instances are designed for high performance databases, web scale in-memory caches, mid-sized in-memory databases, real-time big data analytics, and other memory-intensive enterprise applications. The M5d and R5d variants also include 3.6 TB of local NVMe SSD storage. z1d instances provide high compute performance and lots of memory, making them ideal for electronic design automation (EDA) and relational databases with high per-core licensing costs. The high CPU performance allows you to license fewer cores and significantly reduce your TCO for Oracle or SQL Server workloads. All of the instances are powered by the AWS Nitro System, with dedicated hardware accelerators for EBS processing (including crypto operations), the software-defined network inside of each Virtual Private Cloud (VPC), ENA networking, and access to the local NVMe storage on the M5d, R5d, and z1d instances. Bare metal instances can also take advantage of Elastic Load Balancing, Auto Scaling, Amazon CloudWatch, and other AWS services. In addition to being a great home for old-school applications and system software that are licensed specifically and exclusively for use on physical, non-virtualized hardware, bare metal instances can be used to run tools and applications that require access to low-level processor features such as performance counters. For example, Mozilla’s Record and Replay Framework (rr) records and replays program execution with low overhead, using the performance counters to measure application performance and to deliver signals and context-switch events with high fidelity. You can read their paper, Engineering Record And Replay For Deployability, to learn more. m5.metal instances are available in the US East (N. Virginia and Ohio), US West (N. California and Oregon), Europe (Frankfurt, Ireland, London, Paris, and Stockholm), and Asia Pacific (Mumbai, Seoul, Singapore, Sydney, and Tokyo) AWS regions. m5d.metal instances are available in the US East (N. Virginia and Ohio), US West (Oregon), Europe (Frankfurt, Ireland, Paris, and Stockholm), and Asia Pacific (Mumbai, Seoul, Singapore, and Sydney) AWS regions. r5.metal instances are available in the US East (N. Virginia and Ohio), US West (N. California and Oregon), Europe (Frankfurt, Ireland, Paris, and Stockholm), Asia Pacific (Mumbai, Seoul, and Singapore), and AWS GovCloud (US-West) AWS regions. r5d.metal instances are available in the US East (N. Virginia and Ohio), US West (N. California), Europe (Frankfurt, Paris, and Stockholm), Asia Pacific (Mumbai, Seoul, and Singapore), and AWS GovCloud (US-West) AWS regions. z1d.metal instances are available in the US East (N. Virginia), US West (N. California and Oregon), Europe (Ireland), and Asia Pacific (Singapore and Tokyo) AWS regions. The bare metal instances will become available in even more AWS regions as soon as possible. Most AWS customers have a significant Windows Server deployment and are also tied to a Microsoft licensing program. When it comes to Microsoft products, such as Windows Server and SQL Server, licensing models can easily dictate Cloud infrastructure solutions. AWS provides several options to support Bring Your Own Licensing (BYOL) as well as EC2 License Included models for non-BYOL workloads. Most Enterprise customers have EA’s with Microsoft which can skew their licensing strategy when considering Azure, On-premises and other Cloud Service Providers such as AWS. BYOL models may be the only reasonable implementation path when entering a new environment or spinning up new applications. Licensing can constitute a significant investment when running workloads on public cloud. To help facilitate the maximum benefit of a customer’s existing Microsoft licensing, AWS provides multiple options to utilize BYOL EC2 Dedicated Hosts and Dedicated Instances expose the physical cores of the server to Windows and applications such as SQL Server while allowing licenses with or without Software Assurance to be utilized. Bare Metal as well as VMware on AWS can minimize additional licensing costs. An EC2 Dedicated Host is a dedicated server of a specific Instance Class that is allotted to a single customer, referred to as dedicated tenancy. The density of a host is based on the Instance Size as well as the Instance Type defined at creation. If you chose the M5 Instance Type and chose the m5.large Instance Size, you would have 48 “slots” available on the host to deploy m5.large Instances. If you chose the m5.xlarge, you would have enough capacity to house 24 Instances. Dedicated hosts have a fixed number of vCPU and RAM per Instance Type. To deploy Windows on a Dedicated Host, the customer imports an image (vmdk, ova, vhd) using the import-image utility and tags the image as a “BYOL” in the command. The BYOL flag dictates whether the image will acquire a license from AWS or the customer’s existing licensing framework. When dealing with an oversubscribed customer environment, such as an on-premise VMware deployment, the customer has likely oversubscribed the environment with minimum of 4 vCPU to 1 physical core (4:1). In these environments, Microsoft licensing typically takes place at the host level using physical cores rather than the resources in a provisioned instance (vCPU). An AWS Dedicated Host is oversubscribed 2 vCPU to 1 CPU, meaning each core is Hyper-Threaded. While the math can be performed to show the actual value of a vCPU, customers can be reluctant to modify vCPU configurations to reflect the greater value of the AWS vCPU. Simply matching the quantity of vCPU’s to their current environment may be much more costly and expansive than rightsizing the instances for cost optimization. Below is a sample configuration of a customer interested in migrating to AWS and utilizing BYOL for Microsoft Windows and SQL Server Enterprise Edition. By licensing the 400 physical cores in their cluster, the customer is able to assign any number of vCPU’s to the VM’s deployed on the hosts. Enterprise Architects have spent a considerable amount of time sizing VM’s with the proper resource attributes, so it can be difficult to initiate that process all over again to bring them to the public cloud. In this case, the customer has decided not to right-size their VM’s and instead maintain their current vCPU/RAM specifications. This is a Dedicated Host solution to match their vCPU configurations. If the customer is not willing to consider right-sizing their VM’s by assigning fewer, yet higher powered vCPU’s, they face a considerably larger server deployment. After doing the math, we can determine that the Dedicated Host solution has 2.5 times the power of the VMware solution. Following that logic, and math, right-sizing the VM’s would drop the required vCPU count down to 960 vCPU to match their current solution. This would change the number of required r4 Dedicated Hosts from 38 to 15 hosts and slash the SQL licensing requirements for the solution. AWS does have other products that lend to the BYOL/oversubscription story. EC2 Bare Metal instances and VMware Cloud on AWS gives the customer full control of the configuration of instances just as they have on-premise. The EC2 Bare Metal instances are built on the Nitro System which is a collection of AWS-built hardware offload and security components that offers high performance networking and storage to EC2 instances. EC2 Bare Metal instances can utilize AWS services such as Amazon Virtual Private Cloud (VPC), Elastic Block Store (EBS), Elastic Load Balancing (ELB), AutoScaling and more. The Nitro configuration gives the customer the ability to install a server Operating System or hypervisor directly on the hardware. By utilizing their own hypervisor, the customer can define and configure their own instance configurations of RAM, disk and vCPU. By surpassing the fixed configurations in the EC2 Dedicated Host environment, Nitro configurations enable migrating highly oversubscribed on-premise workloads. The VMware Cloud on AWS offering provides organizations the ability to extend and migrate their on-premise vSphere environment to AWS’s scalable and secure Cloud infrastructure. Customers can leverage vSphere, vSAN, NSX and vCenter technologies to extend their data centers and consume AWS services. vMotion provides the ability to live migrate VM’s to AWS with limited or no downtime. While licensing for migrated VM’s does not change at the VM level, it is imperative that the licensing on the new vSphere node be adequate. Since the customer has complete control of the environment, they have the ability to oversubscribe CPU’s to any ratio. By licensing applications such as SQL Server at the host level, oversubscription rates are irrelevant to licensing. If a vSphere node has 40 cores, as long as the 40 cores are licensed, the number of vCPU’s assigned is immaterial. In the VMware environment, all OS’s and applications are BYOL and no licensing will be provided by AWS. Ultimately, this solution is free of the oversubscription burden that affects certain AWS dedicated tenancy options. EC2 Instance Types offer multiple fixed vCPU to memory configurations to match the customer’s workloads and use cases. With Optimize CPU, customers now have the ability to specify the number of cores that an instance has access to as well as determining if Hyper-Threading is enabled. Hyper-Threading Technology enables multiple threads to run concurrently on a single Intel Xeon CPU core. Each thread is represented as a virtual CPU (vCPU) on the instance. Controlling the threads and core count is significant for Microsoft SQL Server as it is typically more RAM constrained than compute bound. With Optimize CPUs, you can potentially reduce the number of SQL Server licenses required by specifying a custom number of vCPUs. SQL Server on Amazon EC2 is often licensed per virtual core. EC2 vCPU’s are the equivalent of virtual cores. When licensing with virtual cores on EC2, the number of active vCPUs provisioned through Optimize CPUs may indicate the number of SQL Server licenses required. For example, if you have a SQL Standard build that needs the RAM and network capabilities of an r4.4xlarge but not the 16 vCPUs that comes configured on it, you can define the Optimize CPU options in the CLI or API at launch to disable Hyper-Threading and limit the instance to 1, 2, 3, 4, 5, 6, 7 or 8 cores. This example would cut the licensing costs exponentially. The Optimize CPU feature is available for new instance launches in all AWS public regions. To benefit from Optimize CPUs, you can bring SQL Server licenses to Amazon EC2 and use it on EC2 default tenancy or on allocated instances on a EC2 Dedicated Host or a EC2 Dedicated Instance. For a list of supported instance types, and valid CPU counts, see instance type documentation. In this post, we’ve covered three AWS scenarios and how they fulfill specific areas of BYOL with CPU oversubscription scenario as well as how Optimize CPU can help cut licensing costs. EC2 Dedicated hosts are generally the first choice in the Microsoft BYOL realm unless the customer is absolutely unwilling to right-size their highly oversubscribed instances. EC2 Bare Metal instances provide the customer the ability to configure all aspects of their hypervisor of choice and maintain any oversubscription that exists in their environment. This is a very popular choice that requires little change and ultimately gets their workloads to the AWS Cloud. The VMware Cloud on AWS option is sold by and provisioned by VMware. For users that are current VMware customers, this service allows them to bridge the gap between their on-premise data center and AWS while providing a seamless migration path to the Cloud using their current toolsets. When I joined AWS last year, I wanted to find a way to explain, in the easiest way possible, all the options it offers to users from a compute perspective. There are many ways to peel this onion, but I want to share a “visual story” that I have created. I define the compute domain as “anything that has CPU and Memory capacity that allows you to run an arbitrary piece of code written in a specific programming language.” Your mileage may vary in how you define it, but this is broad enough that it should cover a lot of different interpretations. A key part of my story is around the introduction of different levels of compute abstractions this industry has witnessed in the last 20 or so years. The start of my story is a line. 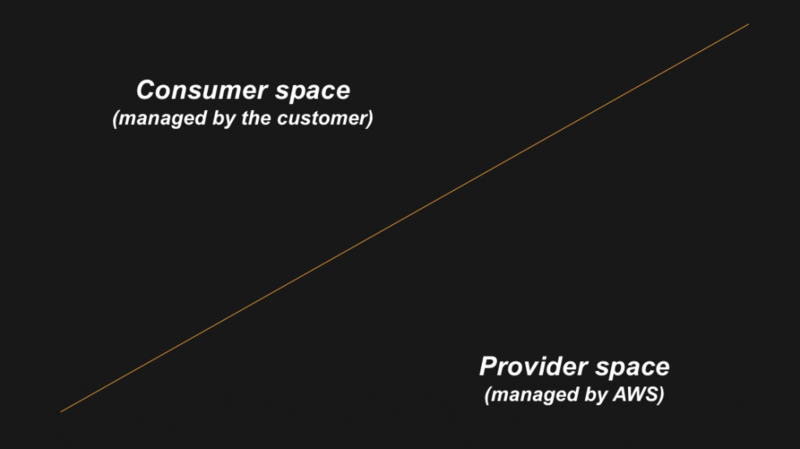 In a cloud environment, this line defines the perimeter between the consumer role and the provider role. 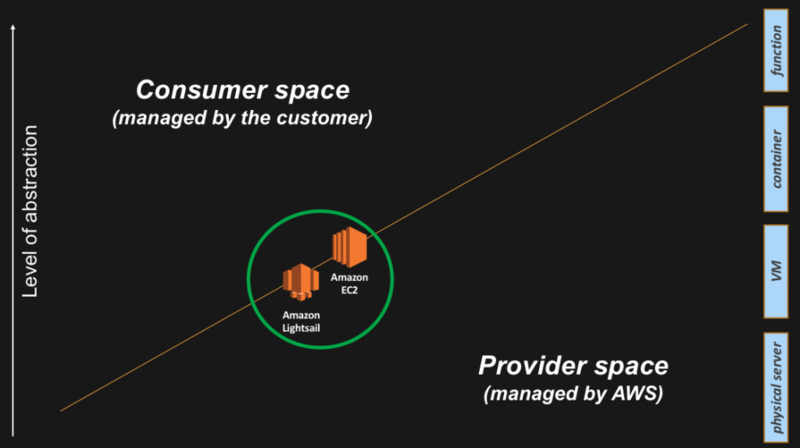 In the cloud, there are things that AWS will do and things that the consumer will do. The perimeter of these responsibilities varies depending on the services you opt to use. If you want to understand more about this concept, read the AWS Shared Responsibility Model documentation. The reason why the line above is oblique is because it needs to intercept different compute abstraction levels. If you think about what happened in the last 20 years of IT, we have seen a surge of different compute abstractions that changed the way people consume CPU and Memory resources. It all started with physical (x86) servers back in the 80s, and then we have seen the industry adding abstraction layers over the years (for example, hypervisors, containers, functions). The higher you go in the abstraction levels, the more the cloud provider can add value and can offload the consumer from non-strategic activities. A lot of these activities tend to be “undifferentiated heavy lifting.” We define this as something that AWS customers have to do but that don’t necessarily differentiate them from their competitors (because those activities are table-stakes in that particular industry). What we found is that supporting millions of customers on AWS requires a certain degree of flexibility in the services we offer because there are many different patterns, use cases, and requirements to satisfy. Giving our customers choices is something AWS always strives for. A couple of final notes before we dig deeper. The way this story builds up through the blog post is aligned to the progression of the launch dates of the various services, with a few noted exceptions. Also, the services mentioned are all generally available and production-grade. For full transparency, the integration among some of them may still be work-in-progress, which I’ll call out explicitly as we go. This is the very first abstraction we introduced on AWS back in 2006. Amazon Elastic Compute Cloud (Amazon EC2) is the service that allows AWS customers to launch instances in the cloud. When customers intercept us at this level, they retain responsibility of the guest operating system and above (middleware, applications, etc.) and their lifecycle. AWS has the responsibility for managing the hardware and the hypervisor including their lifecycle. With the rise of microservices, a new abstraction took the industry by storm in the last few years: containers. Containers are not a new technology, but the rise of Docker a few years ago democratized access. You can think of a container as a self-contained environment with soft boundaries that includes both your own application as well as the software dependencies to run it. Whereas an instance (or VM) virtualizes a piece of hardware so that you can run dedicated operating systems, a container technology virtualizes an operating system so that you can run separated applications with different (and often incompatible) software dependencies. A containers control plane that is responsible for exposing the API and interfaces to define, deploy, and lifecycle containers. This is also sometimes referred to as the container orchestration layer. A containers data plane that is responsible for providing capacity (as in CPU/Memory/Network/Storage) so that those containers can actually run and connect to a network. From a practical perspective this is typically a Linux host or less often a Windows host where the containers get started and wired to the network. Arguably, in a specific compute abstraction discussion, the data plane is key, but it is as important to understand what’s happening for the control plane piece. In 2017, Amazon also announced the intention to release a new service called Amazon Elastic Container Service for Kubernetes (EKS) based on Kubernetes, a successful open source containers control plane technology. Amazon EKS was made generally available in early June 2018. Just like for ECS, the aim for this service is to free AWS customers from having to manage a containers control plane. In the past, AWS customers would spin up EC2 instances and deploy/manage their own Kubernetes masters (masters is the name of the Kubernetes hosts running the control plane) on top of an EC2 abstraction. 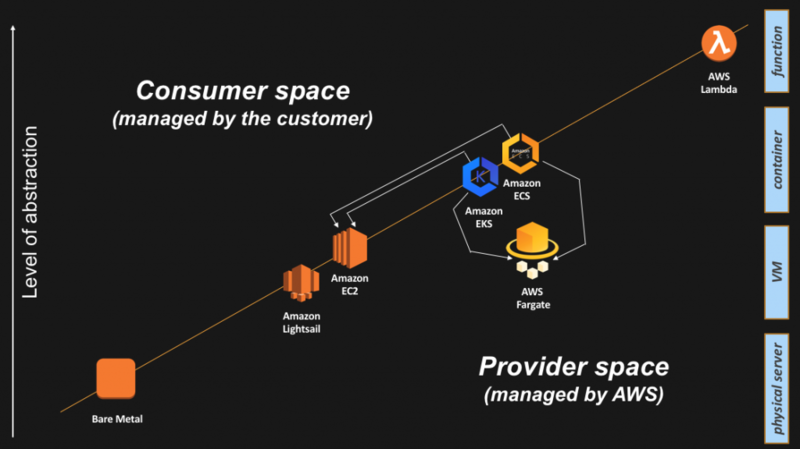 However, we believe many AWS customers will leave to AWS the burden of managing this layer by either consuming ECS or EKS, depending on their use cases. A comparison between ECS and EKS is beyond the scope of this blog post. You may have noticed that what we have discussed so far is about the container control plane. How about the containers data plane? This is typically a fleet of EC2 instances managed by the customer. In this particular setup, the containers control plane is managed by AWS while the containers data plane is managed by the customer. 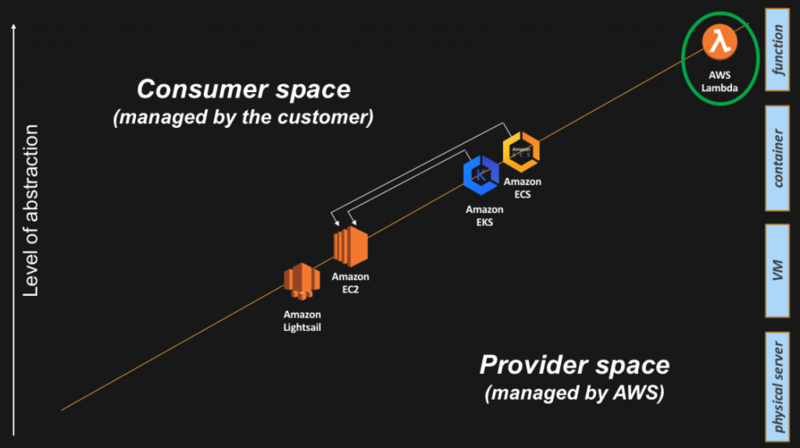 One could argue that, with ECS and EKS, we have raised the abstraction level for the control plane, but we have not yet really raised the abstraction level for the data plane as the data plane is still comprised of regular EC2 instances that the customer has responsibility for. At re:Invent 2014, AWS introduced another abstraction layer: AWS Lambda. Lambda is an execution environment that allows an AWS customer to run a single function. So instead of having to manage and run a full-blown OS instance to run your code, or having to track all software dependencies in a user-built container to run your code, Lambda allows you to upload your code and let AWS figure out how to run it at scale. What makes Lambda so special is its event-driven model. Not only can you invoke Lambda directly (for example, via the Amazon API Gateway), but you can trigger a Lambda function upon an event in another AWS service (for example, an upload to Amazon S3 or a change in an Amazon DynamoDB table). The key point about Lambda is that you don’t have to manage the infrastructure underneath the function you are running. No need to track the status of the physical hosts, no need to track the capacity of the fleet, no need to patch the OS where the function will be running. In a nutshell, no need to spend time and money on the undifferentiated heavy lifting. As recently as re:Invent 2017, we announced (the preview of) the Amazon EC2 bare metal instances. We made this service generally available to the public in May 2018. As a side note, and also as alluded to by Jeff, i3.metal is the foundational EC2 instance type on top of which VMware created their own VMware Cloud on AWS service. We are now offering the ability to any AWS user to provision bare metal instances. This doesn’t necessarily mean you can load your hypervisor of choice out of the box, but you can certainly do things you wouldn’t be able to do with a traditional EC2 instance (note: this was just a Saturday afternoon hack). More seriously, a question I get often asked is whether users could install ESXi on i3.metal on their own. Today this cannot be done, but I’d be interested in hearing your use case for this. Now that we covered all the abstractions, it is time to go back and see if there are other optimizations we can provide for AWS customers. When we discussed the container abstraction, we called out that while there are two different fully managed containers control planes (ECS and EKS), there wasn’t a managed option for the data plane. Some customers were (and still are) happy about being in full control of said instances. Others have been very vocal that they wanted to get out of the (undifferentiated heavy-lifting) business of managing the lifecycle of that piece of infrastructure. Enter AWS Fargate, a production-grade service that provides compute capacity to AWS containers control planes. 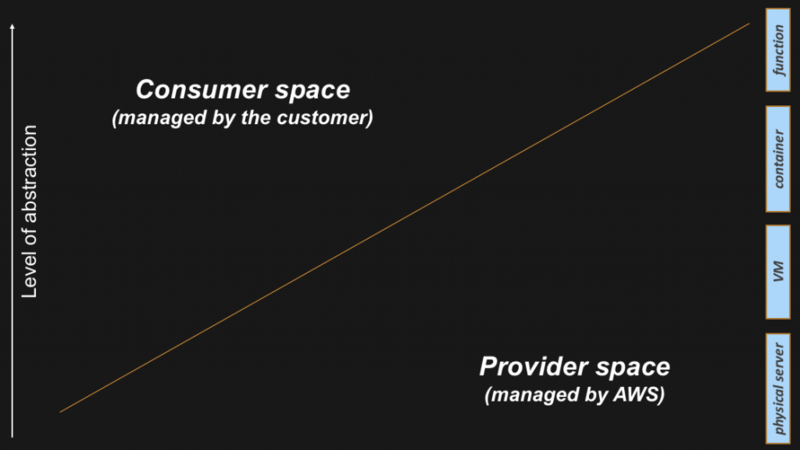 Practically speaking, Fargate is making the containers data plane fall into the “Provider space” responsibility. This means the compute unit exposed to the user is the container abstraction, while AWS will manage transparently the data plane abstractions underneath. 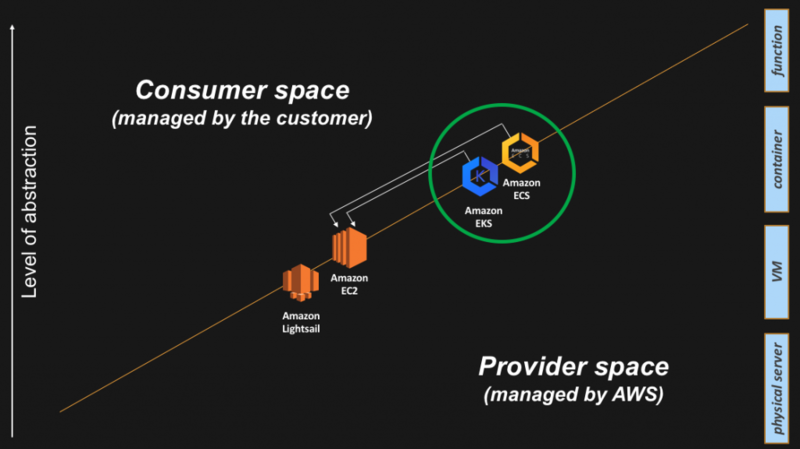 Now ECS has two “launch types”: one called “EC2” (where your tasks get deployed on a customer-managed fleet of EC2 instances), and the other one called “Fargate” (where your tasks get deployed on an AWS-managed fleet of EC2 instances). For EKS, the strategy will be very similar, but as of this writing it was not yet available. If you’re interested in some of the exploration being done to make this happen, this is a good read. 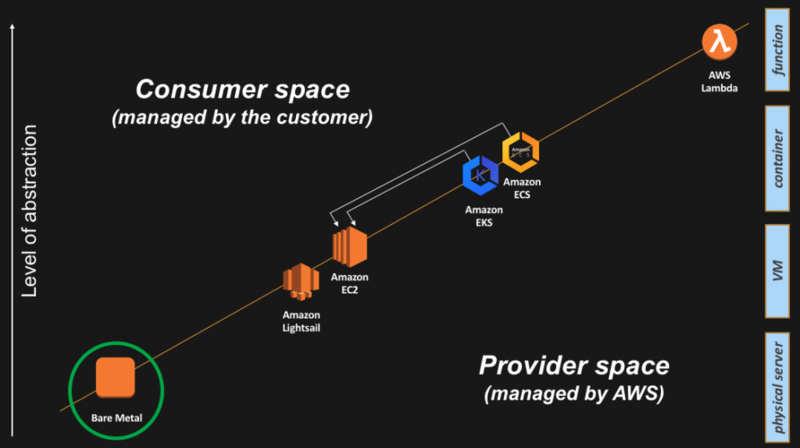 We covered the spectrum of abstraction levels available on AWS and how AWS customers can intercept them depending on their use cases and where they sit on their cloud maturity journey. Customers with a “lift & shift” approach may be more akin to consume services on the left-hand side of the slide, whereas customers with a more mature cloud native approach may be more interested in consuming services on the right-hand side of the slide. In general, customers tend to use higher-level services to get out of the business of managing non-differentiating activities. For example, I recently talked to a customer interested in using Fargate. The trigger there was the fact that Fargate is ISO, PCI, SOC and HIPAA compliant, which was a huge time and money saver for them because it’s easier to point to an AWS document during an audit than having to architect and document for compliance the configuration of a DIY containers data plane. I hope you found it useful. Any feedback is greatly appreciated. Massimo is a Principal Solutions Architect at AWS. For about 25 years, he specialized on the x86 ecosystem starting with operating systems and virtualization technologies, and lately he has been head down learning about cloud and how application architectures are evolving in that space. Massimo has a blog at www.it20.info and his Twitter handle is @mreferre. AWS recently announced the general availability of Amazon EC2 bare metal Instances. This post provides an overview of launching, setting up, and configuring a Hyper-V enabled host, launching a guest virtual machine (VM) within Hyper-V running on i3.metal. Launch a Windows Server 2016 with Hyper-V AMI provided by Amazon. Launch a Hyper-V guest VM. 1. Open the EC2 console. 2. Choose Public Images and search for the Amazon Hyper-V AMIs. 3. Select your preferred Hyper-V AMI, and choose Launch. 4. Follow the Launch wizard process to launch the instance on i3.metal. The Amazon Hyper-V AMIs have the Hyper-V role pre-enabled. You can also launch a Windows Server 2016 Base AMI to i3.metal, and enable the Hyper-V role for your use case. To enable networking for your Hyper-V guests—so they can have connectivity to other resources in your VPC, or to the internet via your VPC internet gateway, ensure that you have first configured your VPC. For more information, see Creating and Attaching an Internet Gateway. In this solution, you are creating an internal virtual switch and using the Hyper-V host as the NAT server for the guest VMs, similar to Microsoft’s topic Set up a NAT network. You can specify your own virtual network range. For this example, use 192.168.0.0/24 as the range for the virtual network inside the Hyper-V host. Determine which network interface is associated with the virtual switch. For this solution, the Get-NetAdapter command shows that the Hyper-V virtual switch has an ifIndex value of 12. Now the environment is ready for the guest VMs to have outbound communication with other resources through the host NAT. For each VM, assign an IP address with the default gateway (192.168.0.1). This can be done manually within each guest VM. 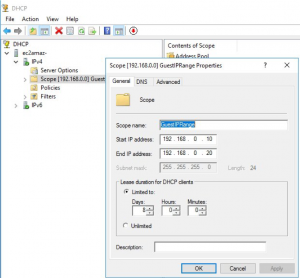 In this solution, you make it easier by enabling a DHCP server within the Hyper-V host to automatically assign IP addresses. To configure the DHCP server to bind on the Hyper-V virtual interface, choose Control Panel, Administrative Tools, DHCP. Select this computer, add or remove bindings, and then select the IP address corresponding to Hyper-V virtual interface (that is, 192.168.0.1). 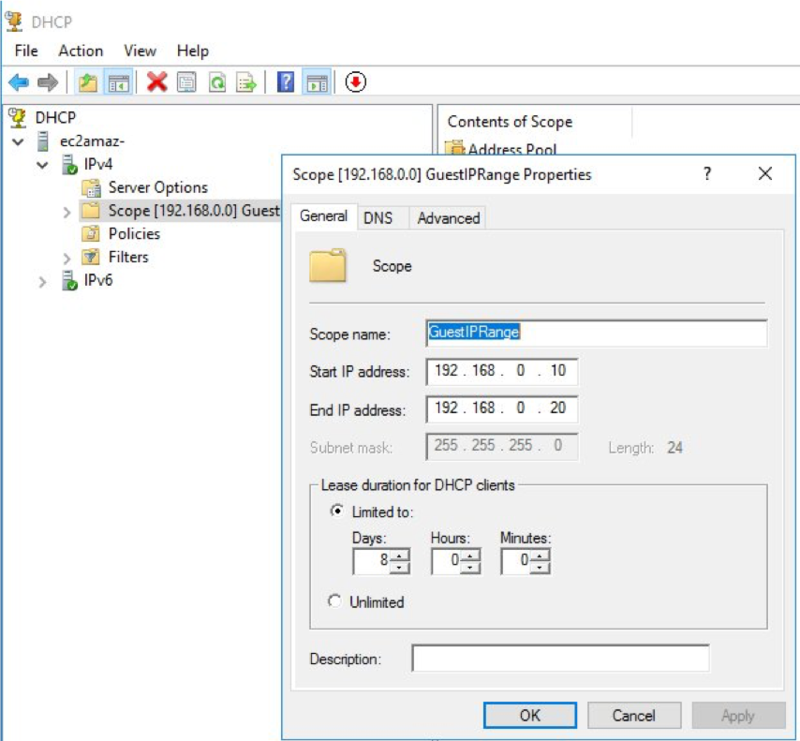 Configure the DHCP scope and specify a range from the subnet that you determined earlier. In this example, use 192.168.0.10~192.168.0.20. For Router, choose the NAT gateway IP address assigned it to the Hyper-V network adapter (192.168.0.1). For DNS server, use the Amazon DNS, which is the second IP address for the VPC (172.30.0.2). For this post, follow the new VM wizard to create an Ubuntu 18.04 LTS guest VM. First, download the Ubuntu installation ISO from the Ubuntu website to your Hyper-V host, and store it on a secondary EBS volume that you added as the D: drive. I3.metal instances use Amazon EBS and instance store volumes with the NVM Express (NVMe) interface. When you stop an I3.metal instance, any data stored on instance store volumes is gone. I recommend storing your guest VM’s hard drive (vhd or vhdx) on an EBS volume that is attached to your I3.Metal instance. This can be the root volume (C:) or any additional EBS volumes attached to the instance. For more information, see What’s the difference between instance store and EBS? In Hyper-V Manager, choose Actions, New, Virtual Machine. Follow the wizard with your desired configuration up to the Configure Networking section. In the Configure Networking step, for Connection, choose Hyper-V Switch, and choose Next. In the Connect Virtual Hard Disk step, enter a name for the virtual hard disk. Use the default location C:\Users\Public\Documents\Hyper-V\Virtual Hard Disks\. Specify the size of the virtual hard disk, and choose Next. In the Installation Options step, choose the Ubuntu ISO that you downloaded earlier. Finish the wizard and start the VM, then follow the steps on the Ubuntu installation wizard. As you have already set up DHCP and NAT for the Hyper-V network, the Ubuntu VM automatically gets an IP address from the DHCP scope that you defined earlier. You’ve just built a Hyper-V host on an EC2 bare metal instance. Now you’re ready to add more guest VMs and put them to work! Last month I told you about the Nitro system and explained how it will allow us to broaden the selection of EC2 instances and to pick up the pace as we do so, with an ever-broadening selection of compute, storage, memory, and networking options. This will allow us to give you access to the latest technology very quickly, giving you the ability to choose the instance type that is the best match for your applications. Z1d – Compute-intensive instances running at up to 4.0 GHz, powered by sustained all-core Turbo Boost. They are ideal for Electronic Design Automation (EDA) and relational database workloads, and are also a great fit for several kinds of HPC workloads. R5 – Memory-optimized instances running at up to 3.1 GHz powered by sustained all-core Turbo Boost, with up to 50% more vCPUs and 60% more memory than R4 instances. R5d – Memory-optimized instances equipped with local NVMe storage (up to 3.6 TB for the largest R5d instance), and will be available in the same sizes and with the same specs as the R5 instances. We are also planning to launch R5 Bare Metal, R5d Bare Metal, and Z1d Bare Metal instances. As is the case with the existing i3.metal instances, you will be able to access low-level hardware features and to run applications that are not licensed or supported in virtualized environments. Electronic Design Automation – As chips become smaller and denser, the amount of compute power needed to design and verify the chips increases non-linearly. Semiconductor customers deploy jobs that span thousands of cores; having access to faster cores reduces turnaround time for each job and can also lead to a measurable reduction in software licensing costs. HPC – In the financial services world, jobs that run analyses or compute risks also benefit from faster cores. Manufacturing organizations can run their Finite Element Analysis (FEA) and simulation jobs to completion more quickly. Relational Database – CPU-bound workloads that run on a database that “features” high per-core license fees will enjoy both cost and performance benefits. The instances are HVM and VPC-only, and you will need to use an AMI with the appropriate ENA and NVMe drivers. Any AMI that runs on C5 or M5 instances will also run on Z1d instances. Once again, the instances are HVM and VPC-only, and you will need to use an AMI with the appropriate ENA and NVMe drivers. The new EC2 instances announced today highlight our plan to continue innovating in order to better meet your needs! I’ll share additional information as soon as it is available. Compute-Intensive – The compute-intensive C5d instances provide a 25% to 50% performance improvement over the C4 instances. They are available in 5 regions and offer up to 72 vCPUs, 144 GiB of memory, and 1.8 TB of local NVMe storage. General Purpose – The general purpose M5d instances are also available in 5 regions. They offer up to 96 vCPUs, 384 GiB of memory, and 3.6 TB of local NVMe storage. Bare Metal – The i3.metal instances became generally available in 5 regions a couple of weeks ago. You can run performance analysis tools that are hardware-dependent, workloads that require direct access to bare-metal infrastructure, applications that need to run in non-virtualized environments for licensing or support reasons, and container environments such as Clear Containers, while you take advantage of AWS features such as Elastic Block Store (EBS), Elastic Load Balancing, and Virtual Private Clouds. Bare metal instances with 6 TB, 9 TB, 12 TB, and more memory are in the works, all designed specifically for SAP HANA and other in-memory workloads. The Nitro system is a rich collection of building blocks that can be assembled in many different ways, giving us the flexibility to design and rapidly deliver EC2 instance types with an ever-broadening selection of compute, storage, memory, and networking options. We will deliver new instance types more quickly than ever in the months to come, with the goal of helping you to build, migrate, and run even more types of workloads. Local NVMe Storage – The new C5d, M5d, and bare metal EC2 instances feature our Nitro local NVMe storage building block, which is also used in the Xen-virtualized I3 and F1 instances. This building block provides direct access to high-speed local storage over a PCI interface and transparently encrypts all data using dedicated hardware. It also provides hardware-level isolation between storage devices and EC2 instances so that bare metal instances can benefit from local NVMe storage. Nitro Security Chip – A component that is part of our AWS server designs that continuously monitors and protects hardware resources and independently verifies firmware each time a system boots. Nitro Hypervisor – A thin, quiescent hypervisor that manages memory and CPU allocation, and delivers performance that is indistinguishable from bare metal for most workloads (Brendan Gregg of Netflix benchmarked it at less than 1%). Networking – Hardware support for the software defined network inside of each Virtual Private Cloud (VPC), Enhanced Networking, and Elastic Network Adapter. Elastic Block Storage – Hardware EBS processing including CPU-intensive cryptographic operations. Virtualized instances can make just about all of the host’s CPU power and memory available to the guest operating systems since the hypervisor plays a greatly diminished role. Bare metal instances have full access to the hardware, but also have the same the flexibility and feature set as virtualized EC2 instances including CloudWatch metrics, EBS, and VPC. To learn more about the hardware and software that make up the Nitro system, watch Amazon EC2 Bare Metal Instances or C5 Instances and the Evolution of Amazon EC2 Virtualization and take a look at The Nitro Project: Next-Generation EC2 Infrastructure. $ aws ec2 run-instances --image-id ami-1a2b3c4d --instance-type r4.4xlarge --cpu-options "CoreCount=6,ThreadsPerCore=1"
To learn more, read about Optimizing CPU Options. Software Development Engineer – EC2 data plane. Senior Software Development Manager – EC2 networking. System Development Engineer – EC2 foundational technologies. Software Development Manager – EC2 nucleus. Senior Systems Development Engineer – EC2 nucleus. Product and Program Management – 38 positions spanning a multitude of EC2 teams, services, and technologies.